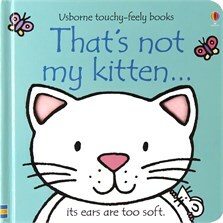 Fabulous board book with glossy pages and textures to touch and feel on every page, including rough paws, fuzzy tongues and fluffy kittenish tummies. Bold illustrations with gentle humour and simple appealing, repetitive text. Designed to promote sensory awareness and language development in very young children. This is my favourite book of my daughter's. Its so sweet, lovely kitten characters. My daughter loves turning the pages and feeling each page. Such a cute book, I definitely recommend it. My daughter got the 1st one of this series when she was 1 year old. She absolutely loved looking at each page, feeling the textured bits and eventually, spotting the mouse on each page!!! Every evening before bedtime, we have to read all of the books that we have got from this series! I would definitely recommend these books for any small child. The pages are hard wearing and they are full of different textures. I know there is still plenty more that I have to buy to complete the collection and I hope usborne continue to provide such wonderful books!